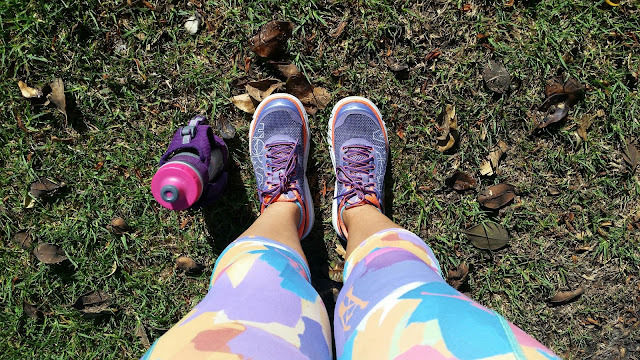 A few months ago I had the opportunity to choose a new running shoe. I was given a gift certificate from my former co-workers as a going away gift. Since I was in need of a new running shoe, I took a chance and tried something new. This past year I have been suffering from plantar fasciitis so I was desperate to try something to take the pain away. So it was in my best interest to explore different options which led me to the Hoka Bondi 4. I had seen this shoe multiple times at the running shoe store, but to be honest I just couldn't get past the overall look of the shoe. I mean it is super bulky! I know most running shoes lately are all about the bright colors so I've been used to that but a shoe with a sole that big was just unheard of. I had to put my shoe insecurities aside and look at the big picture. Since I had read great reviews, I knew that it was really worth looking into. If this shoe could help with my pain then I had to try them. These of course are my own personal thoughts on the shoes. 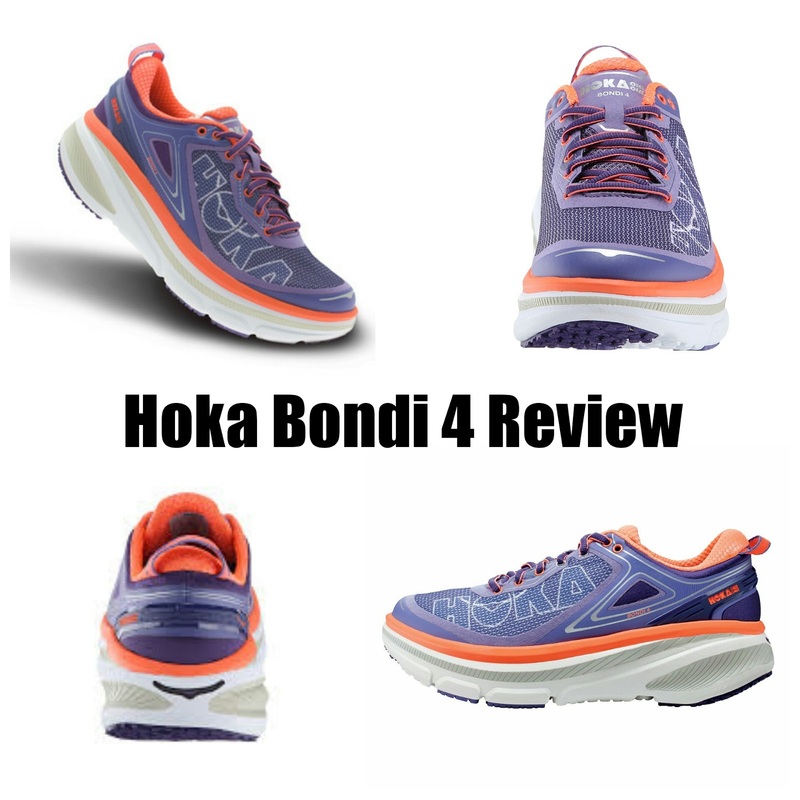 Hoka One One has definitely made a name for themselves in the last few years. They have quickly changed the way you look at running shoes. Their shoes are meant to offer more stability, cushion, and durability. I ended up with the Bondi 4. Once I finally tried them on, my feet felt like they were on a cloud. Yes the shoes looked like clown shoes on me, but they felt so lightweight. I could hardly believe it. Since getting these shoes, I have put in quite a few miles and have even ran a half marathon race wearing them. At first the shoes felt great when I was breaking them in. But as soon as my mileage increased, I started noticing a few changes. My feet would feel a bit hot. Now I've experience this with other shoes, but only when I ran on the treadmill. I had never felt that way when I ran outside though. I also started noticing that as soon as I ran more than 8 miles, I would start to get small blisters. I thought at first it was just because maybe I was wearing the wrong socks. But then on my race day, I got the worst blisters of my life. They seriously looked like tumors growing out of my feet. It was quite gross. Needless to say I was super disappointed since they felt great when I initially purchased them. But here is where I realized something. The shoes still felt like I was walking on a cloud when I just did normal stuff around the house or ran errands in them. And I realized they were still great for running short distances. Since they were a bit on the pricier side ($150), I really wanted to try to find the good in them. So I decided to try them one day for my shift at work. Now my plantar fasciitis pain started from work. Being on my feet all day has definitely taken a toll on my feet. Needless to say, wearing them to work was the best decision I could've made. Not only did I go the whole shift without any pain, but my feet weren't even remotely sore. I swear I hadn't felt that way in almost a year and a half. From that day on, my Bondi 4's became strictly my work shoes and my walking the dogs shoes. Yes I still wear them for a 3 mile run or so, but I have learned my lesson to not use them for long distance runs. I wish the shoes would have worked better for me for my long distance running. At least I found really good use out of them. Honestly I'll continue buying these shoes just for work. They have the best cushion out of any shoe I have ever tried. They still feel great so I can't really complain. I'm so sorry they didn't work out for long runs but glad that you can still use them for day-to-day and shorter runs. I have a pair of Hoka One One Cliftons that are also super cushy but a wee bit big. I haven't gotten much use out of them, but maybe I'll turn them into walking around shoes :). Thanks for linking up with us! Yeah they turned into great work shoes but definitely won't be running any more races with them. I've never tried Hoka and like you I thought they looked a bit odd. Always appreciate and honest review! Yeah I definitely had to get used to how they look. I love my Brooks Ghost 7. I have a pair of Hoka, however I have noticed a lot of pain in my right calf when I run in them. I actually just realized that they were causing it today. Thanks for your honest review. Lately my shoe of choice is actually the Brooks Glycerin. Brooks is great shoe company! Wow interesting review! That stinks that the shoes caused blisters on your long runs, yikes! But at least you've got relief at work. I'm so intrigued by HOKAS...they're just so...platformy. I'm more a sleek shoe type of person. I love my Mizunos. But someday I want to experience the HOKA. I think I've seen one other blogger talk about these. Gosh, they are bulky! But if they're comfortable, it's worth it right? Thanks for your honest review! The most essential thing you have to do before you begin your running system is to get yourself a couple of good shoes. The shoes are important to the point that they can either make or they can break your work out regime. The principle reason the shoes are so critical is that they pad your feet.For the best brooks walking shoes.